← I Love Shrimp and Grits! After seeing the photo in my blog header, my friend Jackie really wanted my bruschetta recipe. I told her this was only one of about a million ways that bruschetta is made and explained how I prepared it on this particular day. She still insisted that I share the recipe so Jackie…this one is for you! The word bruschetta actually refers to the bread that is usually grilled or toasted, drizzled with good olive oil, then rubbed with a fresh cut clove of garlic. The “bruschetta” is then often topped with a mixture of fresh tomatoes, garlic, and herbs. A quick search of bruschetta on Google actually returns over 7,150,000 results, many of which are delicious recipes and the common denominator in nearly every one is the bread, the most important ingredient. Traditionally bruschetta was a use for old bread that was or about to become stale. This was the good, crusty stuff that mom baked in her kitchen or picked up from the local bakery. So in keeping with tradition, when I make bruschetta, I always look to start with a good loaf of Italian bread or a French baguette. And, for the best taste and texture, I always try to serve my bruschetta while it is still warm. To make bruschetta place a whole loaf of good crusty bread on your cutting board so that the right end is pointing towards the lower right corner of the cutting board, and the left end is pointing towards the upper left corner or roughly a 45 degree angle. Now cut ½ inch thick slices with your knife blade parallel to the sides of the cutting board. This should give you nice oval shaped slices of bread. Now lightly toast the slices on a grill or under a broiler until they are crisp but not overly browned. (I toasted mine on a dry cookie sheet placed 6 inches under the broiler just until they were golden.) Once toasted, lightly brush each slice of bread with a little extra virgin olive oil then rub gently with the cut side of a freshly cut in half garlic clove. Now you are ready to make bruschetta magic! On the day the photo was taken, I wanted to make my bruschetta in the style of an Insalada Caprese. So after toasting and following the steps above, I drizzled each piece with a little balsamic vinegar; probably no more than ¼ teaspoon on each. Then I topped each bruschetta with a slice of soft fresh mozzarella, a slice of super ripe fresh tomato, a sprinkle of kosher salt and fresh ground black pepper, and a few ribbons of fresh basil chiffonade. I hope you enjoy this bruschetta and be sure read through a few million of the other recipes on Google <wink!> or use your imagination to come up with your own yummy topping combination! 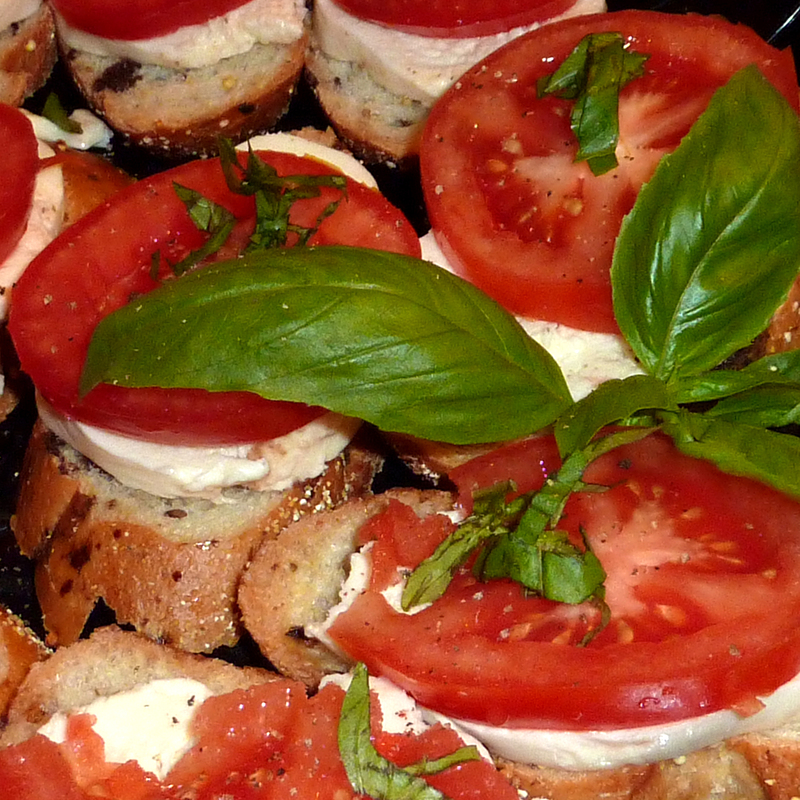 This entry was posted in Appetizer, Meat Free and tagged appetizer, baked, Balsamic, Basil, bread, Bruschetta, Caprese, Chiffonade, cool, crunchy, crusty, food, fresh, Italian, Mozzarella, oil, olive, recipe, Recipes, ripe, toast, Tomato. Bookmark the permalink. Beautiful pic! Will give it a try!